On 14th October 2012 Felix Baumgartner became the first skydiver to go faster than the speed of sound, reaching a maximum velocity of 833.9mph by jumping out of a balloon 24 miles above the Earth in the highest ever freefall. Allow your classes to celebrate this achievement at the same time as developing their subject-specific knowledge and vocabulary with our fantastic interactive learning game – Skydiver. Will all of the questions be answered in time?! The game sees a skydiver hurtling down through the air towards the ground. All eight questions must be answered within the time limit for the parachute to be safely deployed. 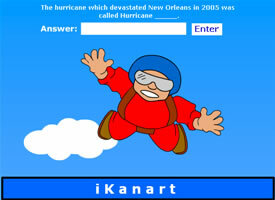 Questions are asked at the top of the screen and the answer is shown with the letters jumbled up at the bottom of the screen. With great cartoon graphics and a real sense of urgency generated with time passing this is a game that your students will love to use to enhance their learning. 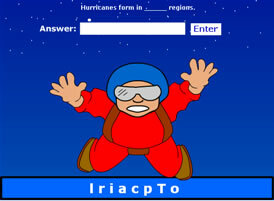 All you need to do to make your own skydiver quiz game is supply a game title, eight questions and eight one word answers. You will also need a Premium Teacher account to create your own games. Why not try making your own interactive learning games using our game generator – 30 different activities to pick from. Full access to our exciting learning game generator is proven to enhance motivation, learning and revision.